I am the mother of an eleven-year-old girl called Kitty. 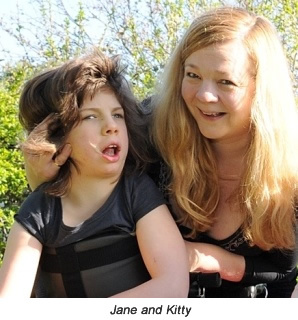 Kitty has severe athetoid cerebral palsy and has been tube fed since birth. Firstly by naso-gastric tube and then, from the age of 7 months, by gastrostomy. I am writing this article to talk about our experiences with giving our daughter a blended diet always through her tube. Kitty has not eaten any prescribed formula since she was one year old. We started it when my breast-milk ran out, but quickly decided to wean her instead. Just the same as a parent with an oral-eating child, I gave her food like mashed up avocado and banana, baby rice mixed with goat's milk or sweet potato. As she grew, we started getting much more adventurous. I bought lots of recipe books aimed at children and underwent a very important stage in my own development as a mother, that of re-claiming the nutrition of my child. I am not sure how much training dietitians have in the psychology of bonding; I have none myself, but I know that this was a huge and crucial step that we took together. I was able to shop for her, cook for her and research nutrition to make sure she always had the very best, balanced diet. Kitty quickly started enjoying pretty much the same foods as the rest of my family. Just as I would for any other child, I would tone down the strong flavours and generally played safe with foods that could upset her stomach or to which she could possibly be allergic. Kitty has remained on the 50th centile for her height and her weight for most of her life. The only time I can think of when she dropped below was during her one and only nasty chest infection. Thanks to the gastrostomy, I was able to keep her fluid levels high, as well as give her food that I knew would help. In this small but important way, I was able to use diet to complement the medicines that were aiding my daughter's recovery. There is nothing wrong with my daughter's stomach: her problems are entirely voluntary-muscular and, in fact thanks to her healthy diet, she is very robust. There is no need, therefore, to be particularly precious when preparing food for her. You simply cook it, blend it and plunge it down the tube. There is no need for special temperature-taking, no need for sterile preparation and no need for her to be any more different to anyone else than she absolutely needs to be. Kitty's diet is extremely well-balanced. In fact, I know of no other child who enjoys such a wide range of good food. What other eleven-year-old has organic millet, buckwheat, oats and quinoa in daily rotation for breakfast? What other eleven-year-old has never ingested a fizzy, sugar and caffeine-laden drink? Or a packet of sweets? Or salty crisps? Or any E-numbers whatsoever? Or has never pushed the broccoli to the side of the plate? Trust me, my giving my daughter a blended diet means she has better nutrition than most people in the whole world. She has also never had any issues with her bowels and her reflux is a thing of the past. There is also the question of expense to the NHS, too. I have been told by a consultant that a year's supply of formula for someone like Kitty, who is 100% tube fed, would cost in the region of £15,000. That means that in her life-time we have saved the Health Service £180,000 and counting. Imagine if all tube-fed children could do that. The puree that Kitty eats is like a thick broth. You have to plunge, sometimes quite hard, to get it down the tube. However, the size of the opening in the gastrostomy button makes it impossible to force food through too quickly. You are simply not able to create the kind of pressure to cause any damage either to her stomach or her gastrostomy tract. It helps, of course, that Kitty's tract is as healthy as possible. She has never had any granuloma, inflammation, leakage or infection. This again I attribute to her healthy diet. Kitty joins us at the table at mealtimes and usually has a plate of food to see, smell and feel, as well as her tube-feed. She tells me she can taste her food and certainly feels the warm, satisfying feeling of having her tummy filling up, enhanced by the smell and sight of food, as well as the social interaction, so important at mealtimes. I believe we were one of the very first families to break away from the prescription formula and start to feed our baby proper food. During one horrific weekend away in a hotel, where we had no cooking facilities, we decided to feed her formula feed for the duration of our stay. Never was her reflux so bad. She coughed continuously, struggled with long, stringy phlegm and was in constant pain so that we were all thoroughly miserable. It all stopped when she went back to eating her usual diet. The formula contains several E-numbers, a high level of fat and lots of different types of sugar. It has plenty of added vitamins and is described as a fully balanced diet. It may be adequate, but it is not as balanced as real food. Otherwise, surely every dietitian in the land would be feeding it to their children. In the last decade of preparing food for my daughter in this way, we have only seen benefits. If the button gets blocked, we simply unblock it. We wash the tube and the syringes along with everything else and there have never been any issues. After all, the stomach is not a sterile environment and my daughter is no different to anyone else in this respect. So why is there so much resistance from dietitians? For the life of me, I cannot work out why there seems to be a mental block where feeding blended food is concerned. It is better for health and cheaper for the NHS, enhances the bond with the family and means that our children don't have to put up with being filled with sugar and fat three or four times a day. Can you imagine if all you were given to eat all day, every day, was Mr Whippy ice cream? I am willing to bet that being on a constant diet of formula doesn't feel much different. My plea to all dietitians is to please open your minds. There really is no reason why children can't eat a blended diet through their tubes. I know it isn't in keeping with your training and I know you can't carefully monitor every calorie or millilitre of fluid, but can you do that with any child? What's the difference between them and a child fed by tube? Food is not a medicine; it doesn't need to be calculated in relation to weight. It's not meant to be specific or analysed. It may go into a child's stomach through a tube, rather than down their throat, but after that there is absolutely no difference. Please remember that tube-fed children are not medical cases. They are children whose swallow doesn't work properly and is therefore being bypassed. They deserve to enjoy the health benefits, the experience of truly sharing food with their families and the vast range of nutrients offered by real food. And surely the NHS deserves to save all that money.